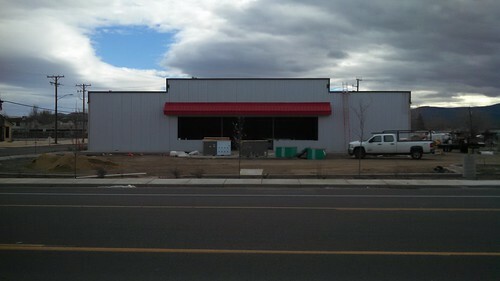 Here's a couple more photos from the progress of the downtown Fernley dollar store. 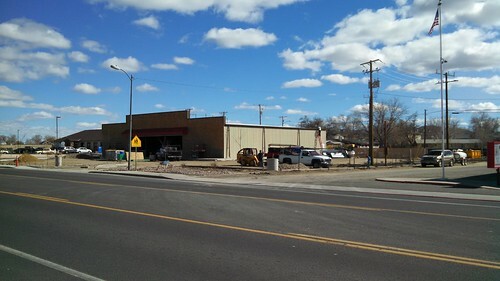 Two days ago: Electrical boxes appeared out front. 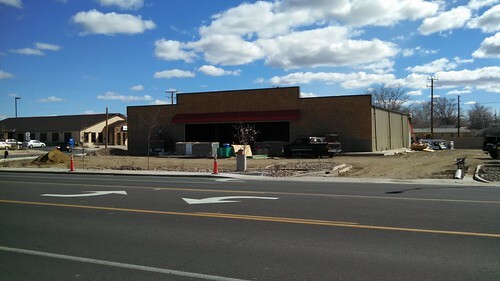 The frontage is now taking shape, with plywood covering the sheet-metal exterior. After collecting the mail yesterday, Lisa and I walked on to Big R Fernley, where their official Grand Opening was under way. The Mayor cut a ceremonial ribbon yesterday morning. Costumed western characters were on hand, as was the local VFW chapter with whom Lisa happily chatted. Each day of the Thursday-Sunday celebration has different offers. Thursday included a free house key cutting (so we got a spare key cut), and 20% off clothing. They had some of the work slacks I prefer, so I picked up a couple of pairs. Today's sale is mostly about pet supplies, so that doesn't do us any good. It was unclear whether tomorrow's home & garden sale included firewood (they couldn't even tell me), which is why we bought a pallet a few days ago rather than waiting for tomorrow. In addition, they're doing drawing for prizes. The top prize is a new pellet stove and a ton of wood pellets. We signed up, but I don't know what we'll do if we win it, as there's no place to put it. (It wouldn't fit in the insert space where our current fireplace is.) We'll consider how to handle that if necessary.